- Conversation/Q&A — 7:00 p.m., University Club of Albany, 141 Washington Avenue, Albany. 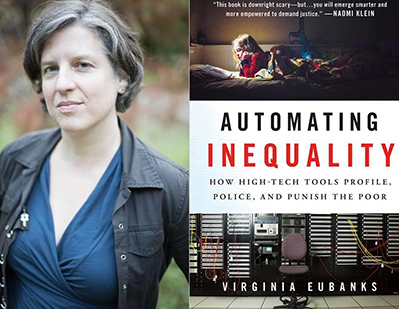 A light reception begins at 6:30 p.m.
Virginia Eubanks author, UAlbany professor, and social justice activist, will discuss her book, Automating Inequality: How High-Tech Tools Profile, Police and Punish the Poor (2018), during a talk at 7 p.m. Friday, October 19, at the University Club of Albany, 141 Washington Avenue, Albany. For more information, contact The University Club at 518-463-1151. The event is presented by the NYS Writers Institute in collaboration with the University Club of Albany.